Getting there! Almost back to normal, everything in the bug room has been fed, cleaned and watered since returning from Costa Rica (most of them twice). All is looking good, Georgie (assisted by Josh, her boyfriend) did a great job with all the animals while I was away. I am trying to cut back on the animals until after Christmas but everything keeps breeding so I am still spending hours caring for the ‘mini zoo’. My motto for moving forwards is “more personal - less postal” and it is going well. I’ve had a few people call to collect their orders since I returned and I have finally sorted out the dates for a spider evening and open afternoon. I am always trying new rules and regulations when people call so I am going to be different this time by not setting any! Not sure how this will go, it may be chaos as my bug room is not very big or perhaps no one will turn up. We will see, I would like to have regular events so this will be an experiment. I have many pretty spiders that nobody gets to see so it would be good to show them off in the evening when they ‘all come out to play’. Not sure how this will work but I will give it a go J The open afternoon will be a couple of hours where people can come to look around and hopefully buy something. The spider evening will be admiring the various tarantulas but there is no obligation to buy. Sorry, I do realise that many of you will be too far away, even in different countries but if you are near enough and able to make the journey, that’s great. If it all goes horribly wrong I will learn from my mistakes for the next time! If nobody turns up to the spider evening I will be in the lounge watching Coronation Street. Costa Rica is still firmly on my mind. I actually met a guy out there who was as bonkers as me. He was brilliant fun, out on holiday with his young daughter and they were both animal mad. I first became aware of him when we went out on a Tui organised coach trip. Each time we got off the coach I could hear the Costa Rican tour guide shouting out Adam, I thought it was a friendly cry but by the end of the day I realised it was out of horror as Adam spent the day turning over rocks and wandering off from the crowd to look for creepy crawlies. He found a scorpion and actually saw a snake too. I got some good photos of the scorpion but sadly I missed the snake. Poor George the guide was having kittens over the scorpion (yes, I know it was dangerous but we didn’t touch it), he pointed out that there were Rattle snakes in the area. As you can imagine ‘Adam’ and I were most excited and wanted to know where! It turned out that Adam is not the guy’s name, his surname is Adams and I’m sure George would be happy to never see him again J I on the other hand thoroughly enjoyed the guy’s exploits around the hotel where he found some amazing creatures and it’s thanks to him that we saw the beautiful armadillo in this week’s photo. Next week I will tell you about our adventures in the jungle, hubby and I literally got talking to a guy in a bar and it went from there. One of the weirdest afternoons I’ve ever had but what fun and great memories. No health and safety on that trip but we survived! I had a funny incident recently at my local reptile centre, they haven’t been open all that long but I am clearly a regular customer and they know me as Ginny. They have been very good giving out my Ginny’s Jungle party leaflets. I was chatting to one of the girls down there and mentioned my website being virginiacheesema.co.uk, she exclaimed “oh my god, you’re Virginia Cheeseman! I must introduce you to everyone”, I couldn’t stop laughing as they already knew me, I was still the same person but suddenly I felt famous J I realised some time ago that as Virginia is such an old-fashioned name, most youngsters don’t realise that Ginny is the shortened version of Virginia. 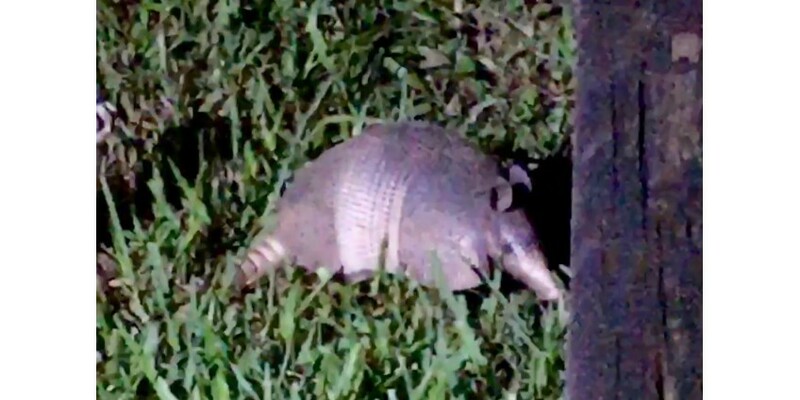 I think our armadillo was a three banded one, I have never seen one before (only in a zoo) and didn’t know they had different numbers of bands. Oh, I LOVE Costa Rica.